this is very good as kinilaw, MM. it is very crisp when raw. “adductor muscle”, i think, it what it’s called (am not sure). however, the ones I’ve tried before were from the taklobo (giant clam), long before these were endangered. in Leyte and Samar, scallops are called “tipay”. hmmm. are scallops the same as “capiz”? as in the ones they used in old windows and lamps? that’s how “tipay” was translated to me by relatives in leyte. Never had the opportunity in my entire life to have a taste or seen tipay meat. Now you introduce them to me and I am glad to know how they are – they look exotic to me. I am very familiar with mother of pearl when well crafted it is a masterpiece either as a piece of jewelry, carved and framed as a piece of wall hanging ornaments or part of the tableware ensemble. Very, very cool indeed! Not just a new taste but a very rare bit of meat. 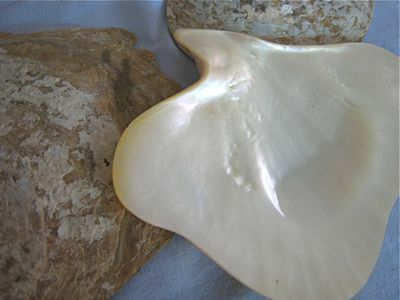 Incidentally, Wikipedia’s description refers to the giant clam as a geoduck clam. Not!!! Just google geoduck clam and you’ll see what I mean. Since these clams are “farmed”, I wonder why the meat is not readily available (or is it)? Grreat read MM, tenks a lot! Hi MM, anent your survey. I made carbonara using your recipe, only I used bacon available in the supermarket, and just one type of cheese-Kraft parmesan. Still, it was very good. Thanks! pictada maxima is the host for the south sea pearls. Yes they’re quite delicious alright. Quite yummy around the neck. yes, choy, your tipay are scallops. Hi MM…if what you were given to eat belonged to the goduck family, the neck is the prized meat and can cost an arm and a leg. It is usually sliced paper thin and eaten raw with a dipping sauce similar to an Oriental dressing like Ginger Sesame dressing just napped over the paper thin slices….MASARAP!!!! 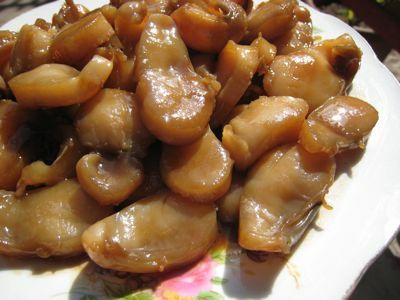 But here is the best part, I think…if they are a CLOSE relative to SCALLOPS both in TASTE and TEXTURE, maybe you can coax them into turning it into a cottage industry like making the XO SAUCE recipe that I shall be sending to you via my sister. You can show them what the raw ingredient and the finished product looks like. I think it will be a good source of revenue for them instead of discarding them. DRIED SCALLOPS can cost an arm and a leg depending on the grade….sounds good? A bit out of topic but considering Marketman’s a huge mangosteen fan, I thought you would be interested in this article from Forbes magazine. Tommy, thanks for that link. I have always been wary of Xango/pyramid type sales schemes. Frankly, I’d like to know how much mangosteen goes into each bottle if they are selling $350 million worth a year! And since the seasons are so short, how they are storing all this mangosteen pulp and who is peeling it as I haven’t seen a mangosteen peeling machine yet… On the flipside, I should charge PHP2,000 ($50) for a tiny bottle of my artisanal mangosteen jam and sell a limited edition of just 100,000 bottles a year globally and I will make a mint! :) At least I can prove I put about two kilos worth of mangosteen fruit is in every 8 oz bottle of jam!!! the only successful pyramids are the ones where the pharaohs are buried in.